A surprising number of materials are suitable for basement flooring. This basic tutorial will help you evaluate your basement's challenges and weigh each material's pros and cons—even those prone to dampness. Surprise! It’s all right to install virtually any type of flooring in your basement. Although hardwood should be avoided, homeowners have a plethora of other choices. 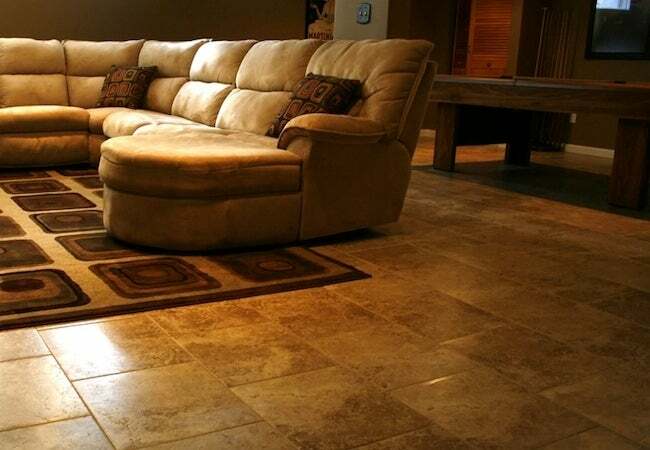 Vinyl, ceramic tile, carpeting, linoleum, cork, laminate—all of these materials, and even some less common ones, can be successfully used as basement flooring. If the good news is that you have a wide range of options, the bad news is that basements are the most challenging part of a house in which to install flooring. To complete your project, you may have to overcome an out-of-level subfloor, ceiling height issues, or, most likely of all, problematic moisture. The vast majority of basements in America are constructed using concrete, one of the most durable materials available to home builders. One of concrete’s few weaknesses, however, is porousness, which means that it allows water vapor to enter the basement through the slab floor and foundation walls. Particularly in older homes, moisture can also enter the basement through cracks in the foundation or at the joint between the foundation and exterior walls. The effect of water or water vapor is to raise the moisture content of flooring materials that are sensitive to humidity—hardwood and fiberboard above all. This moisture can cause wood flooring to swell or buckle over time. Worse, the flooring can develop mold or fungus before starting to rot and deteriorate. How does one keep water vapor at bay? The conventional approach is to install a vapor barrier over the slab. Manufacturers offer a bevy of options, such as roll-down plastic or felt sheets, paint-on coatings, and moisture-inhibiting adhesives. Different products are appropriate for different flooring materials, so the best vapor barrier for your basement will largely be determined by the type of flooring you are planning to install. An alternate means of managing water vapor is to raise your floor off the slab. The air gap between the installed flooring and foundation slab encourages moisture to dissipate. 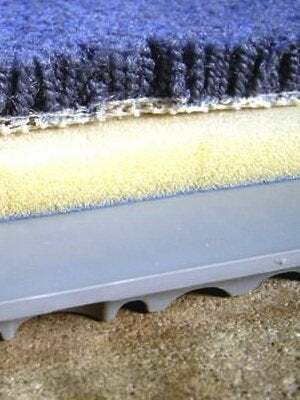 Various companies sell waterproofing membranes that work on this principle; dimpled plastic matting is a popular design. Also available are basement flooring tiles with a built-in vapor barrier. Topped by decorative vinyl squares or carpeting, these tiles feature molded plastic bases that enable the concrete slab to breathe. Plus, because the tiles are modular and interlocking, they can be removed, washed, and reinstalled after a flood. Despite the best efforts of contractors everywhere, basements still flood and probably always will. If your basement has chronic flooding issues, it’s imperative that you take steps to address them. That means keeping water away from your foundation through proper site grading and installing a sound drainage system. Consider, in addition, a sump pump (and a back-up sump pump). Finally, be realistic in your choice of basement flooring, as standing water simply dooms some materials to the Dumpster. In short, choose something that can get wet. If your basement is out of level, you can use a self-leveling cement to create an even subfloor. Follow the instructions closely: It is important to prepare the old concrete surface and apply a bonding agent. Basements rarely boast extra headroom, especially if the ceiling accommodates HVAC air ducts. Even if a floor adds just a couple of inches, this slight increase can spell the difference between meeting or falling short of the minimum ceiling height prescribed by your local building codes. Identify a low-profile basement flooring solution, if necessary. As elsewhere in the home, the basement affords homeowners many flooring options. But if you don’t like to take chances, you can’t go wrong with ceramic tile, the Cadillac of basement flooring. 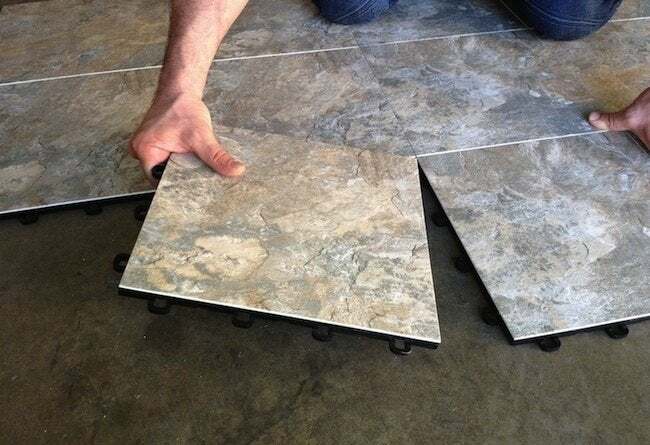 Unaffected by water or water vapor, ceramic tile may be installed directly over a concrete slab, helping to conserve precious inches in a low-ceilinged space. Another great option is glue-down vinyl tiles or planks, which emerge none the worse for wear even after repeated flooding. Bear in mind that this isn’t your parents’ vinyl; today’s products can emulate the look of wood, ceramic, or stone rather convincingly. Engineered wood is yet another option, although you can expect swelling or buckling should the material be submerged. Typically, engineered wood flooring comes in tongue-and-groove planks, the top layer of which is a laminated veneer. Some are glued down, while others “float” unattached to the underlayment. Floating floors offer easy, adhesive-free installation, but note that basement moisture can affect any product that contains fiberboard (for example, cork). Here’s the bottom line: If you install any flooring that includes organic material adversely affected by water, you risk having to tear out the floor in the wake of a flood. You also risk the unseen buildup of mold beneath the flooring—a considerable risk to the air quality of your home.